These NCLEX review practice questions will test you on pressure ulcers. Pressure ulcers are now called pressure injuries. As the nurse you will want to know how to prevent pressure injuries along with identifying risk factors, and how to stage various pressure injuries. Don’t forget to watch the lecture on pressure injuries before taking the quiz. 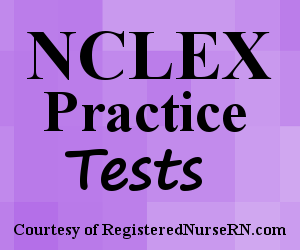 This quiz contains practice pressure injury (formerly called pressure ulcer) NCLEX questions in preparation for the NCLEX exam. A. A 19 year old female who is a quadriplegic. B. A 35 year old male with a BMI of 13.6 that is incontinent of stool and has a right leg splint. C. A 55 year old female who has controlled diabetes and is ambulating three times a day. D. A 76 year old male with an elevated ammonia level and is excessively sweaty. E. A 45 year old with a Braden Scale score of 7. A. There is full loss of skin tissue that can extend to the muscle, bone, or tendon. B. 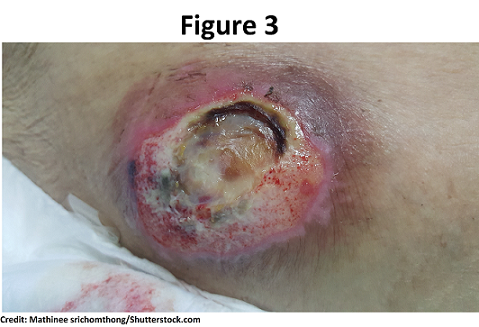 A hallmark of a stage 3 pressure injury is that the skin will be intact but it not blanch. 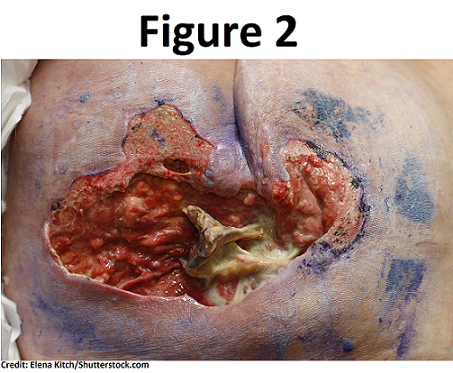 C. The skin will not be intact and there will be full loss of skin tissue that can extend to the subcutaneous tissue. D. The wound edges will never roll away (epibole) as with a stage 2 pressure injury. A. When feeding the patient keep the head of bed elevated at 45' degree and avoid elevating the foot of the bed. B. Apply barrier cream as needed to the skin daily. C. Turn the patient every 4 hours. D. Keep linens and gowns dry and wrinkle free. E. Use a wedge pillow for the right and left legs daily. 1. An 86 year old female patient is immobile and is in the right lateral recumbent position. As the nurse you know that which sites below are at most risk for pressure injury in this position? The answers are: B, C, D, F, and H. The right lateral recumbent position is where the patient is positioned on their right side. Therefore, the ankle, ear, hip, knee, and shoulders are sites where a pressure injury can occur. The answer is E. This represents a stage 2 pressure injury (formerly known as a pressure ulcer). The skin is visibly damaged and NOT intact with PARTIAL loss of the dermis. No subq (fatty tissue) is visible. 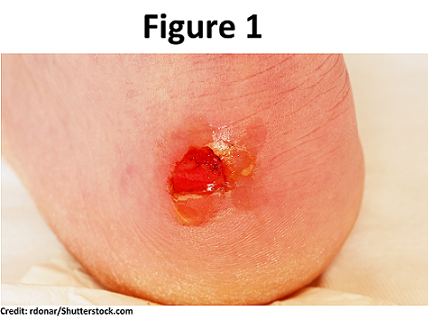 These wounds may be opened with a superficial red/pink ulcer or may have the formation of an opened or closed blister. The answer are A, B, D, and E. The only patient not at risk for a pressure injury is the patient in option B. Remember altered sensory perception, any type of moisture issue (incontinence, sweating etc. ), immobility, poor nutrition, altered mental status (high ammonia level can cause confusion and drowsiness), Braden scale score less than 9 are all risk factors for a pressure injury. 4. You’re educating a group of nursing students about the different stages of a pressure injury. Which statement is correct about a stage 3 pressure injury? The answer is C. This is the only correct statement about a stage 3 pressure injury. 5. You receive report that your patient who will be admitted to your unit has a stage 4 pressure injury. Which figure above represents this type of injury? The answer is B. Figure 2 represents a stage 4 pressure injury. The answer is D. This pressure injury is unstageable. Note the slough and eschar in the wound bed. As the nurse you are unable to assess the depth of the wound, therefore, it is currently unstageable. 7. While performing a skin assessment on a patient who is immobile, you note a purplish black area on the patient’s left heel. The skin is intact. On palpation the site feels heavy and spongy. You suspect this may be? The answer is B. Deep-tissue injuries presents as purplish or blackish areas over skin that is intact. The fatty tissue below is injured. Also, may look like a black blistered area and may feel heavy or squishy. A. When feeding the patient keep the head of bed elevated at 45′ degree and avoid elevating the foot of the bed. The answers are B, D, and E. Option A is wrong because when the patient is sitting up you want to prevent them from sliding down in the bed. This can cause friction and shear, which can lead to a pressure injury. Raising the foot of the bed when the HOB is elevated will help prevent the patient from sliding down. Option C is wrong because you will need to turn the patient every 2 hours NOT every 4 hours. Option E is beneficial for the leg contractures to prevent a pressure injury to the knees and ankles.